Published in the South Kent Gazette, 3 December, 1980. The Electricity Supply Station on the Dour side, separated by the river from the Maison Dieu, was built on a piece of land 250 feet by 125 feet. The station building was divided longitudinally into a machinery room and a boiler house, the former 116 feet by 30 feet, and the latter 100 feet by 42 feet, both spanned by iron glazed roofs, from which their principal light was obtained. Originally, a part of the western end was devoted to offices, but the clerical department was later transferred to Maison Dieu House, the whole of the Station then being devoted to electricity generation. The building was practically fireproof, all the floors being of concrete, upon iron girders. The outer walls were 22 inches thick, of brick and red terra-cotta dressing, the inside of the walls being of white glazed bricks to give lightness to the interior. The internal partition walls were constructed on iron lattice - work, filled with concrete. Everything in connection with the building was remarkably substantial, the chimney being the conspicuous object in the valley, rising to a height of 120 feet. Its foundation was a bed of concrete 24 feet square, and' seven feet thick, sunk ten feet below the ground line. The fabric of the chimney consisted of two rings, the outer and inner rings being kept separate, all the way up, except at certain points where they were joined by piers, the hollow between the two rings being provided to keep the chimney cool, and with the same object the outer' ring was inset at intervals, with galvanised iron gratings. The size of the shaft was 14ft 6in in diameter at the base, and ten feet diameter at the top, where it was finished by a handsome terra-cotta cap, its upper rim being of iron, elevated 120 feet above the ground level. In the boiler house, arranged crosswise, was a battery of six Babcock and Wilcox’s patent water-tube steam boilers, which were specially economical as to space and fuel, as well as being safe and durable. Three of these were installed when the station was built in 1894, and three more were added in 1896, when this station was called upon to supply current for the electric trams. Each of these boilers had a heating surface of 1966 square feet, economy being enhanced by the gases, after leaving the boilers, passing through an economiser of 200 tubes, by which the remaining heat was utilised to raise the temperature of the feed water. Additions were made to this side of the building when the extra boilers were put in, to provide further storage for 700 tons of coal. In the engine room, the machines, consisting of engines and dynamos, were arranged in couples, the engines receiving their impulse from the neighbouring boilers, while the dynamos converted the steam power into electric energy. At the west end was the switch gallery from which the attendants governed operations. As the demand for electric current increased there were alterations and additions to the generating machinery. At first, there was but one kind of current generated — the alternating high tension, for lighting, which could also be used for driving small motors; but other machines, supplying direct current, had to be installed as well to meet industrial demands. The generating plant in use when this book was written, in 1906, consisted of one Parsons turbo alternator, 400 kilowatts at 3000 revolutions per minute; one Ferranti alternator and engine, 400 kilowatts one Mordey alternator, 75 kilowatts, driven by Brush engine; two Mordey alternators, 100 kilowatts, driven by Brush engines; one 30 kilowatt motor generator, for converting alternating into direct current, or vice versa (generally used on Sundays for supplying light on the alternating currents from the storage battery); making a total alternating current plant (omitting the motor generator) of 1075 kilowatts. 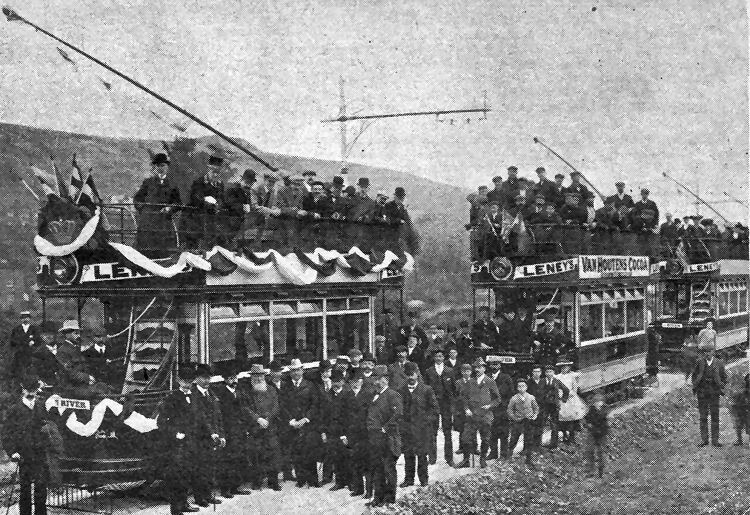 For the ceremonial opening: of the Dover Tramway extension from Buckland Bridge to River Church, on October 2, 1905, there was a procession of four tramcars to River. The trams were decked with flags, the leading car, driven by the Hon George Wyndham, MP, being given special treatment, with extra bunting. And there was special treatment of another kind for Dover’s MP when the procession began. As soon as he had turned on the current and set off there came three sharp volleys from detonators which had been placed on the rails. This was the signal for loud cheers from spectators who lined the first part of the route up Crabble Hill, to witness the inauguration of the new service. Only one technical hitch marred the arrangements. The current used by four cars up a long gradient proved too much for the system and a fuse was blown. But the party was soon on its way again. On arrival at Minnis Lane, River, there was more cheering and the MP, Dover’s Mayor, Sir William Crandall, and other dignitaries posed for this picture taken by Dover photographer C. S. Harris. There were more volleys from detonators as the party set off back to Dover where the mayor provided light refreshments in the town hall and the MP proposed a toast to the success of the tramway. In the afternoon 1,200 enthusiasts, keen to be able to tell their grandchildren they rode on the trams on the first day, made the journey to River, followed by 2,100 the following day. After negotiating the New Bridge corner into Northampton Street the Dover trams had at least two more tight turns to make, one at the Sailor’s rest home corner into Snargate Street and then this one, by the Imperial Hotel, onto Commercial Quay and thence into Strond Street. 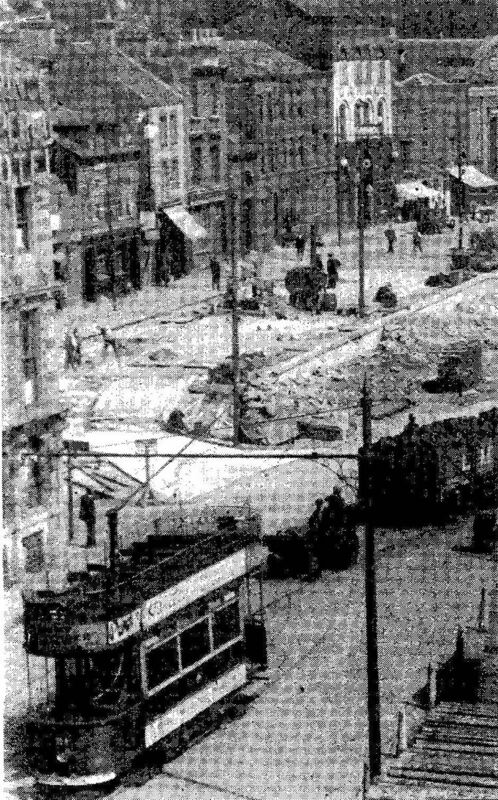 The picture was taken in May 1931 during the widening of Snargate Street. On the extreme right is the old Methodist chapel.